Earn FREE continuing education credits or general participation certificates. The UNC Cancer Network offers FREE continuing education credits (CME, CNE, ACPE, and ASRT) for healthcare professionals throughout North Carolina. To find out about our upcoming live lectures, please visit our Telehealth Professional Events Calendar. To receive credit for an existing lecture (formatted as a Self-Paced, Online Course) please visit our Learning Portal. All lectures feature UNC faculty and other oncology professionals to deliver lectures on the latest treatments, clinical trials, and supportive services available to North Carolina cancer patients. 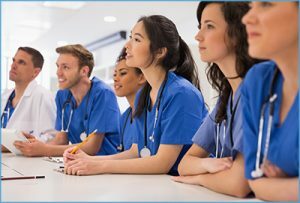 We offer Live Lectures each month: the RN and Allied Health lectures (see schedule) take place on the second Wednesday of each month, and the Medical and Surgical Oncology lectures (see schedule) are usually on the fourth Wednesday. Both are from 12:00 to 1:00 pm and offer continuing education credits. The NC Community College lectures (see schedule) take place about four times a year, are Mondays from 10:00 to 11:00 am, and provide general participation certificates. Each lecture is recorded and put into the Learning Portal as a Self-Paced, Online Course. Credit is awarded to participants who view our lectures and successfully complete post-tests through our UNCCN Learning Portal. You may also view all of our lectures without receiving credit, either through our free UNCCN MediaSite Lecture Library or our UNCCN YouTube Channel.